During the Great Recession of 2008-09 there was significant pressure on the City’s General Fund. Some members of council actively campaigned to close the two golf courses that were funded by Lease Revenue Bonds that are repaid by the General Fund. Los Lagos golf course did not perform at the rosy level predicted by the consultants when the golf course was constructed in 2000. The General Fund covered operating losses as well as debt service. Through the years of operation, there were multiple audits of the operations and seemingly endless memos on the subject. The most recent auditor report suggests that Los Lagos could be self-supporting for operational costs, but not debt service. More details are outlined in the consultant report on Public Outreach presented to the Parks Commission in June, 2017. 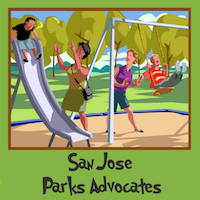 In March 2017, San Jose Parks Advocates invited the City Auditor to give a presentation on Los Lagos and her department’s analyses. City Park staff attended and answered questions. Our group identified a strong preference for continued use as open space or recreation and brainstormed questions for this white paper. The key question—: “What is the best use for this property?” Results follow. The requirement to replace the park land with like park land makes it nearly impossible to develop the land as anything but park land. The golf course is chartered park land. It appears to have been acquired mostly with 1965 city bond proceeds and possibly with funds from the 1964 State Park Bond and Housing and Urban Development (HUD) open space program. The golf course property is part of the original “Coyote River Parkway,” a joint County-City concept running from Williams Street to Anderson Dam. Conceived in the 1950s, it was included in the County’s 1965 General Plan and was part of the City of San Jose’s park bond in 1965. In 1964, a California state park bond was passed and the City and County jointly applied for funding for Coyote River Parkway. The State’s program required a 50% match and reimbursed. At the same time, the Federal Housing and Urban Development Department (HUD) was administering the Land and Water Resource grant program for open space. 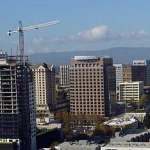 HUD issued a list of City of San Jose Assessor Parcel Numbers that qualified for their funding. Examining California State archives, state budget publications, and newspaper report, we determined that the County won $4.5 Million on behalf of San Jose in the first year of grants. Roughly 112 acres of Los Lagos were acquired between 1967 and 1969. We believe most acres were acquired with San Jose bond proceeds and may have been partially reimbursed by the County as the dispersing agent for the state bond and HUD monies. One of the parcels appears to be a land swap for widening of Highway 101. The land Caltrans took was a chartered park parcel. Importantly, California’s Park Preservation Law requires that park land that is transferred to a non-park use must be replaced by parkland that is similarly developed. (Public Resources Code 5400-5409). This 1971 law cover parks acquired previously. State grants also require that parkland must be replaced if taken out of park inventory. It takes an act of the legislature and approval of the California Park system with the replacement parcel specified. We found multiple legislative examples; all replacement parcels were nearby, i.e. within a mile. Similarly, the HUD Contract for San Jose requires replacement parkland in the nexus of the original park. These requirements are in addition to San Jose’s requirement that registered voters must approve the sale of the land. For these reasons, we do not think it is possible to convert the usage of this land to non-park use. Some neighbors are interested in a high quality neighborhood park and community gardens. There is a fear of negative impacts of a poorly managed property. In 1969, the City and County re-affirmed their joint commitment with a Coyote River Parkway Policy Statement covering Williams Street to Anderson Dam. A revised joint master plan was issued in 1972. Both agencies continued to apply for outside funding and acquire properties as funding permitted. All of present-day Los Lagos properties were acquired by 1980. The 1972 plan called for Los Lagos area to be a multi-use area: a greenbelt with picnic areas, free play meadows, amphitheater and multiuse terrace. Subsequently, a boating lagoon was envisioned. A golf course was targeted for the area near Singleton Road. As a first step, Senter Park, a large neighborhood park, was built on the west side near present- day holes 4 and 6. Adjacent tracts were built in the 1970s and 1980s. A community garden was built. Long-time neighbors report extensive dumping, grass fires, and transient use. They fear a return to an unmanaged open space. In 2000, construction of Holes 13 and 14 in the northernmost parcels, forced the relocation of the Wildlife Center of Santa Clara Valley and a portion of the operations of the San Jose Conservation Corps. The community garden and Senter Park were removed. An odd-shaped remnant (now Lone Bluff Park near Capitol Expressway) was offered as a Vietnamese Cultural Garden. Ultimately, it became an ordinary odd-shaped neighborhood park. In 2017, neighbors who remember Senter Park on the west side report anger at the tiny odd-shaped Lone Bluff park. One Vietnamese neighbor wondered why “her country’s” memorial was removed. We believe that flood control capacity is important to preserve; we agree with riparian advocates that the riparian corridor must be protected. A map of the golf course’s original master plan indicates the 100 foot riparian setback. A portion of the driving range and parts of holes 13 and 14 on the east side are within the riparian setback. The golf cart trails intrude into the setback. Portions of the Coyote Creek multi-use trail was placed deep in the riparian habitat and there was significant controversy about the placement of the trail. A final decision moved the trail away from the golf course and closer to the creek, deep within the riparian habitat. After the riparian habitat was removed, mitigation of about 5 acres was performed off-site. Riparian advocates highlight this removal as a key impetus to pursue a riparian ordinance and improved Envision 2040 General Plan language that was not in place at the time of the golf course construction. The 100-year flood line shows on the original master plan. The 2017 floods follow this line very closely. Flood waters covered Hole 9 (east side, near club house) and the west side Holes 3, 4, 6 (part), 13 (part) and 14. Water depth varied on the course from three to five feet. Within the channel, water depth was estimated at up to 15 feet. The water drained from the course over a three-day period and the course opened thereafter. The riparian corridor is very wide at Los Lagos and the captured water helped to save the neighborhoods downstream from further damage, i.e. at Rocksprings, at 28th Street and at the Mobile Home Parks downstream near Old Oakland Road. 1 The Taskforce drafted a Riparian Corridor Setback Policy for the park chain, which served as a prototype for the subsequently improved citywide riparian policy and ordinance. On the western side, for two thirds of the length of the course, the 100-year flood plain line leaves less than 150 feet of land beyond the flood line, severely limiting the development potential of most of the western side. Increasing the width of usable area via levees and regrading would reduce the water carrying capacity, thereby impacting other downstream areas. The eastern portion of the golf course is less constrained by the flood plain. However, a bench of the original Coyote River channel is on the eastern side; it splits the property in the southern half. The cost per round includes the debt service while it does not for any other sport; we believe this is wrong. Only operating subsidies and rate of recovery of operations should be used to evaluate the program; it should match how other city sports are evaluated. Reducing the General Fund’s burden is laudable goal. Unfortunately, the original consultant reports in 1999 set up expectations that the debt service would be paid by the golf rounds. However, the original forecasts did not include the cost of Prevailing Wage which adds annual operating cost of over $300,000. We note that the results show that the players’ fees exceeds the PRNS voluntary goal of 40% operating cost recovery. The 2015 city auditor report indicated an operating subsidy of $6 per round, or 90% cost recovery. No other sport reaches this standard of recovery. Only a few recreation classes and camps meet this level. In the auditor’s 2015 report, debt service costs of the lease revenue bonds are reported at $30 cost per round. We believe this number also includes the debt service for the Coyote Creek trail passing through the golf course. No other sport or community center activity is evaluated based on the debt service carried through bond measures and through commercial paper used to finance city operations. The construction of the Los Lagos Golf Course is a sunk cost. It cannot be recovered. The debt service would remain even if the land were repurposed to another recreational program. The quality of the Los Lagos program should be evaluated on metrics that are within the control of the council and the operator—operating costs and cost recovery. The rate of cost recovery should be evaluated in light of discounts and subsidies to various groups—e.g. seniors, youth. In addition, Los Lagos Golf Course returns other benefits to the community—open space, habitat preservation, and flood control. These benefits are difficult to quantify on an annual basis but should be acknowledged in analysis of costs. The City’s Voluntary Prevailing Wage program adds costs but provides social value by increasing wages. The impact of this cost should be acknowledged in a report of cost per round subsidy. We believe the Golf Course (or other proposed operations) should be evaluated by a more sophisticated demographic analysis and the needs of these various populations. Marketing opportunities exist for different demographic bands, including events other than just golf (or other proposed operation). Reports about Los Lagos provide simple analysis of who is playing, with age and gender as the focus. Ethnicity is not recorded. We observed play on a Saturday and during a weekend afternoon. Seniors tend to be white. Middle age players tend to be evenly split among the three largest ethnic groups. Youth players from the high schools reflected the demographics of participating high schools. Seniors reported the advantages of Los Lagos. The individual holes are shorter matching their strength. In addition, the terrain of the holes is gentle and more compatible with hip and knee replacements. Other public courses have holes that are too long and/or terrain that is difficult to navigate for those with replaced hips and knees. Retired County Planner Don Weden speaks regularly on the upcoming tidal wave of seniors. The peak of the “baby boom” is just reaching retirement age. The City’s community centers have been adding “Active Adult” options for people over 55, reflecting this growing band of active older folks. This suggests that Los Lagos is uniquely positioned to take advantage of this demographic trend. The City has joined the 8 to 80 Cities movement—creating cities for all. Founder Gil Penalosa spoke recently at several engagements in San Jose including the San Jose Public Life Summit, sharing exciting ideas for involving more ages and abilities in the public space. The Los Lagos Golf Course already provides opportunities for users age 8 to 80. Through creative scheduling of diverse events, the property could also attract broader demographics than a traditional golf course operation. The current operator has been experimenting with community events: holidays, National Night Out, free concerts, movie nights, and more. We believe that an advanced demographic analysis of San Jose’s current and forecasted population would help to identify marketing opportunities. We believe that the City’s self-created Prevailing Wage Program for Services should be re- evaluated prior to releasing an RFP for a new golf course operator. When evaluating costs, the council should receive reports on the impact of the City’s self-created Prevailing Wage for services requirements in order to understand costs and social benefits of this Prevailing Wage program. Specific job titles and their rates should be re-evaluated to more accurately describe the work and reflect city and industry practices. Prevailing Wage is the name a prior city council chose to label the city’s self-created program to mandate pay scales for operators of the golf course and some other outside vendors providing city services. This has led to confusion with the California state-mandated Prevailing Wage program for construction contracts. The California state program was designed to make construction contract bids equitable and prevent wage theft and fraudulent bidding practices. The state provides the salary/wage rate data for a variety of construction jobs. Shortly before Los Lagos opened, the City Council invented a San Jose only “prevailing wage program” for service contracts as a method to address what the Council believed was the inadequate state minimum wage law. The city’s self-created Prevailing wage program is NOT the Living Wage policy. It is not the state’s mandated Prevailing wage program for construction contracts. The San Jose Prevailing Wage program for services was implemented prior to San Jose’s Living Wage policy. San Jose staff created a Prevailing wage schedule for the golf course. Data from private golf courses was not available, so they depended on public course data and other methods that are not readily transparent. The city audits the compliance of the vendor. The City Auditor’s reports highlight the impact of the city’s self-created Prevailing Wage program on Los Lagos golf course; Prevailing Wage increases the personnel operating cost by about 20%. The Auditor concluded that city’s self-created Prevailing Wage for services contributes significantly to the inability of Los Lagos Golf Course to fully cover the cost of operations. The San Jose Prevailing wage cost is between 50 and 100% of the operating subsidy, depending on the year. The current City-created Prevailing Wage rate scale contains at least one major anomaly—the mower pay rate. The people who mow the lawn are paid $44.93 per hour. PRNS staff explained that the city’s Prevailing Wage categorizes these workers as “heavy equipment” operators, i.e. bulldozers, excavators, backhoes, cranes. At Los Lagos, there is a $18 per hour pay differential between mowers and grounds workers. At the City of San Jose and at the other CourseCo courses, there is no pay differential between mowers and course workers. At Los Lagos, the highly paid mowers are sent home as soon as mowing is complete, working only 75% of the year with very few hours during the winter. The pay differential for these two mowing jobs alone add $18,000 to the cost of operating Los Lagos. The City’s self-created Prevailing Wage program for services turned out to be a critical problem for the new softball complex which attracted only one operator bid. The single bidder refused to pay the city’s self-created Prevailing Wage program wages. Consequently, City staff will be the operator. Vendors did not bid on the aquatic program citing the City’s self-created Prevailing Wage program. This suggests that Prevailing Wage provisions might prevent some vendors from bidding on a future golf contract—leading to city staff operating the course. Importantly, if the city is forced to operate the golf courses as an unintended consequence of the current self-created Prevailing Wage program for services, there will be the difficulty of hiring the key personnel needed. For example, the turf and greens manager is a very specialized and highly compensated professional who is critical for the consumer perception of course maintenance. The city may find recruitment of these individuals to city employment more difficult than an industry vendor. City staff should estimate the cost of city staff operating the course prior to releasing an RFP. The continued operation of the golf course appears to be the most viable for limiting impact to the General Fund. Various golf course memos have suggested a variety of alternatives including, 1) sell a portion for housing and pay off debt, 2) close course and operate as open space, 3) build soccer complex, 4) build a cricket field, 5) convert to disk golf course, and 6) continue operation of the golf course, explore ways for improved profitability and community involvement. The land was acquired by park bond funds, with some a mixture of local, state and Federal monies. City requires expensive registered voter ballots to approve the sale. Further, state law requires replacement of the park with comparable land nearby, i.e. through taking other land. State legislative action is required for state-funded lands. In addition, the Park Preservation Act of 1971 severely limits sales of any parkland to public agencies, requiring replacement parkland no matter the source of funding. It appears that there would be no net cash generated by a sale to pay off the debt and the remnant and replacement lands would still have to be managed or operated. Some expressed interest in operating the land as a natural space with walking trails and a few picnic areas. With this option, the lease revenue debt would remain and there would be very limited income from parking revenue or picnic reservations. Some amenities could be installed that might generate some modest rental income but that would incur capital costs. City staff estimated maintenance and ranger costs at $1.5M to $1.8 M in an email to SJ Parks Advocates. This is three times the current cost of net operating loss Los Lagos Golf Course. This option considers building a soccer complex that would be attractive for tournaments and help meet the need for additional sports fields. Tournament fees and rentals would help cover the cost of operation. Tournament fees and rentals would help cover the cost of operation. Tournaments may attract out-of-towners who rent hotel rooms. Currently, many San Jose residents attend tournaments in the Central Valley due to a lack of facilities nearby. We investigated some popular soccer complex tournament venues. Typically, these sites have 2 or more adult sized artificial turf fields and then another 8 or more full-size turf fields that can be split for youth games. Typical size is 40 acres with adjacent parking of 10 acres. The newer complexes also include a playground/park and food service. Newer complexes are fully self- contained with single point entry. Several new complexes have been built in the Central Valley in order to attract Bay Area business. They are within day trip driving distance but also offer low cost camping and motel alternatives. Older complexes are smaller and have fewer fields. Some complexes contract with nearby schools to extend the number of fields available for tournaments, e.g. Davis. There is some data the Morgan Hill sports complex had positive impact to their hotel industry. They have 11 fields with 325 parking spaces and 26 acres land-banked for possible future expansion. Currently, there is an RFP for operators with proposals due in mid-February, 2018. A soccer complex at Los Lagos would require paying off the lease revenue bonds and incurring additional debt to build the complex. A future bond could shift the cost directly to the taxpayer instead of the General Fund. It is not clear whether the lease revenue bond could be paid by bond proceeds. The east side of Los Lagos is large enough for a few fields with modest grading. However, building a complete complex would require very extensive grading due to the historic Coyote Creek bank in the terrain. The flood plain and riparian setback would complicate field arrangement. The parking lot would need to be expanded significantly to meet the needs of tournament play. The west side of Los Lagos is more narrow. Field construction would require extensive grading due to the ancient bank. The riparian setback and flood plain severely constrain the available space to generally south of the Coyote Creek crossing. Direct vehicular access to the west side is limited and through residential neighborhoods. The walking distance from the east side across the bridge over Coyote River makes locating a soccer field on the west bank unattractive to families. The appended map shows the riparian setback, floodplain, and sample fields. Operating costs would depend on the size of the complex. For guidance, the new soccer complex is estimated to cost about $750,000 per year to operate. There would be additional costs related to managing the remnants of the golf course, whether opened as a public park or maintained as natural open space. The benefits to the hotel industry may be limited. San Jose’s large population may fill many tournament slots. The proximity and ease of access to many Bay Area cities may encourage players to commute home rather than stay overnight. At community meetings, the soccer community did not make a showing. 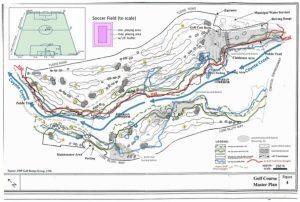 When the idea of soccer fields was presented, neighborhood residents reacted negatively and pointed to the problems associated with the Tully Ball fields which are nearby. A cricket field uses about 10 acres for field and parking. Grading and construction costs would be incurred. It would generate limited income and would not cover its operation cost. There would be maintenance and ranger costs for the remnant land created by carving a cricket field out of the golf course. It would exceed the current operating loss of Los Lagos. The debt service for the cricket field construction and Los Lagos would remain. This growing low cost sport could use the golf course as is. The course could be allowed to “go wild” and O & M costs would be lowered to around $1.5M per year. There are several free courses nearby. However, it is unlikely that disk golfers would pay a fee to use this course; if a fee were implemented, it would not be anywhere near $51 per round paid by golfers. Continue operation as a golf course. Increase marketing to community. Provide community- oriented events. Rent space for weddings, luncheons, events. All kinds of sports should be available for all kinds of people. More expensive sports or activities sponsored by the city should have opportunities for discounts or scholarships. Some materials indicate a dislike for golf as a “rich man’s” sport that the city should not subsidize. We note that the course provides discounted rates to youth and seniors. There are lower fees on select days. Public golf courses like Los Lagos allow the sport to be available to middle income residents; private courses are available to higher income persons only. The General Plan’s housing element highlights the need for all kinds of housing. The City subsidizes the higher cost of streets, sewers and lights in order to provide the executive housing neighborhoods for its higher income residents. The original Los Lagos master plan indicated the importance of meeting the recreation needs of the managerial folks the city was trying to recruit in order to encourage businesses to relocate. The golf course was seen as one tool. We don’t know whether it is as important now as it was in 1999, but it may be. We believe that the continued operation of Los Lagos Golf Course is in the best interest of the City. It provides the most revenue and lowest impact to the General Fund. It provides open space, significant flood protection and meets the needs of citizens for a life-long sport. In addition, the social benefits of exercise for users, open space for those in surrounding neighborhoods, flood control for those downstream, and habitat preservation are all worthy and outweigh the modest operating subsidy which would be greater if Los Lagos were used for anything else. As the alternatives analysis shows, only this high fee sport allows the operation of such a large mid-city open space at such a low net operating cost. Figure 1. Los Lagos golf course. Adapted from EIR. Red line is as built trail alignment. Blue wavy line is 100-year flood plain and conforms closely to February 2017 flood. Green lines are riparian border and setback. Soccer field dimensions are included for scale. Grey dashed line shows slope from original creek bank. Park Impact Fees and Los Lagos Golf Course's Future..
2. The new rate is proposed for citywide--not just downtown. All future high-rises in urban villages or along transit corridors would pay fees based on these downtown rentals--even though the areas are park deficient (unlike downtown) and may not be at all like these downtown rental high-rises. 4. 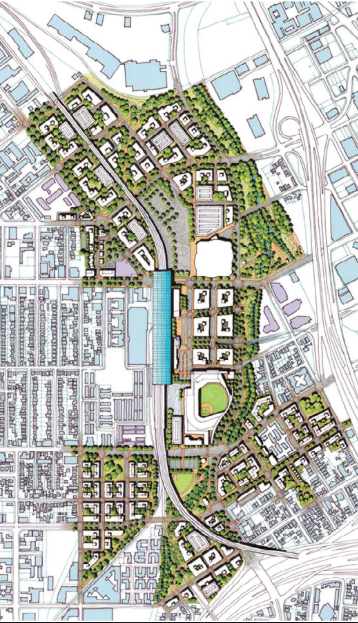 Diridon Station Area Plan advocates oppose the extension of the current high rise discount program into this part of downtown west of highway 87. These lands are the future "Googleville" and they wonder why the richest corporation in the world and its partners can't afford to pay full fees to improve this former industrial area into a livable and vibrant community with walking trails, and a park for the thousands of planned residents and workers. Old Downtown has large parks but Googleville does not. The outreach results, constraints, and options for the future of Los Lagos Golf Course will be presented this Wednesday December 6 to the Parks Commission. Council is worried about the cost of debt payment and the on-going operating cost. Generally, community meetings supported the golf course. The land is constrained by riparian/creek setbacks, and the rules of the state grants the funded the land. The dimensions make a soccer complex infeasible. Benefits are highlighted: an enormous flood plain to catch last winter's waters, and an operator monitor the homeless problem and keeping the area clear of dumping. The staff suggests council could revisit the Prevailing Wage requirement (which is normally applied only to construction contracts) and look at other ways to make the destination more of a community park. Trends in golf are summarized. Staff is asking for direction from the council, which could include pursuing state legislative relief to sell the property. The staff report is attached to Item VII D of this week's Park Commission.